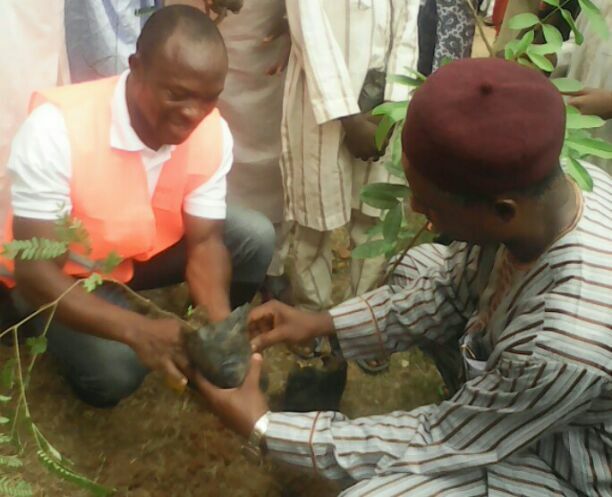 A non-governmental Organization (NGO), GreenAid, Kaduna, Nigeria advancing sustainability in its continuous efforts to provide good environment has caused 1500 economic trees to be planted for residents of Unguwar Kudu, Unguwar Rimi, Kaduna North Local Government Area, Kaduna State, Northwest Nigeria. The trees comprise of improved mango, orange, guava, oil bean trees and the local dinya trees among others. GreenAid in its advancing sustainability programmes, is involved in environmental sustainability, climate-smart agriculture, disaster risk reduction, climate change, agro forestry and renewable energy. Chief Executive, GreenAid, Dr. Tabi Joda explained at the tree planting ceremony that, the trees planted are meant to assist in providing conducive environment to the beneficiaries including fresh air, protection from the direct heat of the sun, serve as wind breaker, source of traditional medicine as well as that of livelihood from the harvest of their fruits. Dr. Tabi Joda added that the trees will also help in controlling earthquake, flood, climate change which is dangerous to human beings as well as storm and hurricane wind. “GreenAid had earlier planted trees for the residents that have been of tremendous environmental help to them. The present gesture is to further boost your disposition to a better health,” he said. The Village Head of Unguwar Kudu, Alhaji Jibril Mohammed Jibo commended GreenAid for their gesture, and appealed to his subjects to ensure seriousness in handling the project while assuring that they’ll take care of the trees. The Sarkin Unguwar Kudu, Alhaji Abdullahi Wada said that, it is a very welcoming gesture and wished that GreenAid would do more in the years to come, while wishing the outfit many years of success, and called on his subjects to take tree planting seriously to safe their environment from desert encroachment.